There’s a new report of a terror attack in Egypt. 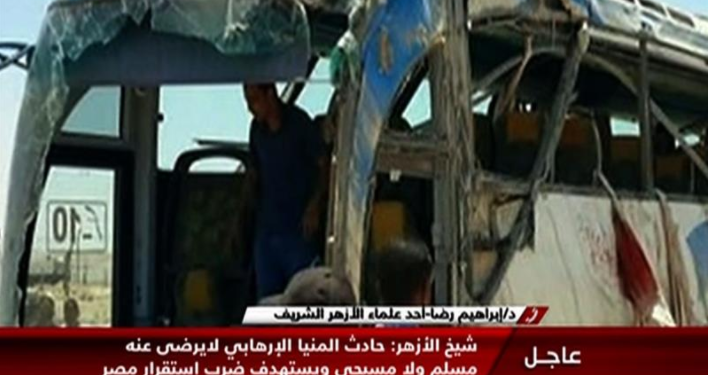 According to Egypt’s Health Ministry spokesman Khaled Mugahed in a chat with TV al-Masriya, gunmen opened fire on a bus carrying Coptic Christians south of the Egyptian capital this morning killing 26 people and wounding 25. Egypt has been fighting Islamic State group-linked militants who have waged an insurgency, mainly focused in the volatile north of the Sinai Peninsula. Coptic Christians have faced persecution and discrimination in Egypt, which has spiked since the toppling of Hosni Mubarak’s regime in 2011. Dozens have been killed in sectarian violence. Coptic Christians make up about 10% of Egypt’s population of 91 million. They base their theology on the teachings of the apostle Mark, who introduced Christianity to Egypt.